OSB is easily identifiable by its characteristic wood strands. Oriented strand board (OSB), also known as flakeboard, sterling board and aspenite in British English, is a type of engineered wood similar to particle board, formed by adding adhesives and then compressing layers of wood strands (flakes) in specific orientations. It was invented by Armin Elmendorf in California in 1963. OSB may have a rough and variegated surface with the individual strips of around 2.5 cm × 15 cm (1.0 by 5.9 inches), lying unevenly across each other and comes in a variety of types and thicknesses. 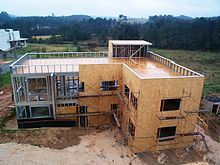 OSB is used in housing construction. OSB is a material with favorable mechanical properties that make it particularly suitable for load-bearing applications in construction. It is now more popular than plywood, commanding 66% of the structural panel market. The most common uses are as sheathing in walls, flooring, and roof decking. For exterior wall applications, panels are available with a radiant-barrier layer pre-laminated to one side; this eases installation and increases energy performance of the building envelope. OSB also sees some use in furniture production. Oriented strand board is manufactured in wide mats from cross-oriented layers of thin, rectangular wooden strips compressed and bonded together with wax and synthetic resin adhesives (95% wood, 5% wax and resin). The adhesive resins types used include: urea-formaldehyde (OSB type 1, non-structural, non-waterproof); isocyanate based glue (or PMDI poly-methylene diphenyl diisocyanate based) in inner regions with melamine-urea-formaldehyde or phenol formaldehyde resin glues at surface (OSB type 2, structural, water resistant on face); phenol formaldehyde resin throughout (OSB types 3 and 4, structural, for use in damp and outside environments). The layers are created by shredding the wood into strips, which are sifted and then oriented on a belt or wire cauls. The mat is made in a forming line. Wood strips on the external layers are aligned to the panel's strength axis, while internal layers are perpendicular. The number of layers placed is determined partly by the thickness of the panel but is limited by the equipment installed at the manufacturing site. Individual layers can also vary in thickness to give different finished panel thicknesses (typically, a 15 mm (0.6 in) layer will produce a 15 cm (5.91 in) panel thickness). The mat is placed in a thermal press to compress the flakes and bond them by heat activation and curing of the resin that has been coated on the flakes. Individual panels are then cut from the mats into finished sizes. Most of the world's OSB is made in the United States and Canada in large production facilities. The largest production facilities can make over 1,000,000 square feet (93,000 square metres) of OSB per day. Materials other than wood have been used to produce products similar to oriented strand board. Oriented structural straw board is an engineered board that is made by splitting straw and formed by adding P-MDI adhesives and then hot compressing layers of straw in specific orientations. Strand board can also be made from bagasse. In 2005, Canadian production was 10,500,000 m2 (113,000,000 sq ft) (3⁄8 in or 9.53 mm basis) of which 8,780,000 m2 (94,500,000 sq ft) (3⁄8 in or 9.53 mm) was exported, almost entirely to the United States. In 2014, Romania became the largest OSB exporting country in Europe, with 28 % of the exports going to Russia and 16 % to Ukraine. Adjustments to the manufacturing process can impact differences in thickness, panel size, strength, and rigidity. OSB panels have no internal gaps or voids, and can be water-resistant, although they do require additional membranes to achieve impermeability to water and are not recommended for exterior use. The finished product has properties similar to plywood, but is uniform and cheaper. When tested to failure, OSB has a greater load-bearing capacity than milled wood panels. It has replaced plywood in many environments, especially the North American structural panel market. Unfortunately, its use as sheathing has contributed to the leaky condo crisis, as it is less able to breathe and release moisture than plywood. The resins used to create OSB have raised questions regarding the potential for OSB to emit volatile organic compounds (VOCs) such as formaldehyde. Urea-formaldehyde is more toxic and should be avoided in home use. Phenol-formaldehyde products are considered to be relatively hazard-free. 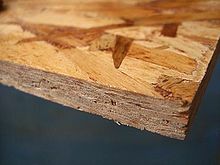 Some newer types of OSB, so-called "New-generation" OSB panels, use isocyanate resins that do not contain formaldehyde and are considered non-volatile when cured. Industry trade groups assert that formaldehyde emissions from North American OSB are "negligible or nonexistent". ^ "Dokument US000003164511A" (PDF). DEPATISnet. Deutsches Patent- und Markenamt. Retrieved 2 May 2016. ^ a b "Technical Information". Osb-info.org. Retrieved 2016-05-02. ^ Marotte, Bertrand (19 July 2016). "Toronto's Norbord riding the rising wave of OSB sales". The Globe and Mail. Retrieved 20 September 2017. ^ "Review of the Canadian structural panel market". Fordaq.com. Retrieved 2016-05-02. ^ "Romania has become the largest OSB exporting country in the EU". Fordaq. Fordaq S.A. 7 April 2014. ^ "UMass Amherst: Building and Construction Technology » Choosing Between Oriented Strandboard and Plywood". Umass.edu. 2015-09-04. Retrieved 2016-05-02. ^ Chaya Kurtz (2010-05-12). "Experts Talk About Engineered Wood - Articles". Networx.com. Retrieved 2016-05-02. ^ MacLeod, Ian. "I'm concerned about toxic offgassing from OSB subflooring and roofing". Green home guide. Retrieved 2015-11-14. ^ "Oriented Strand Board Educational Bulletin, Frequently Asked Questions" (PDF). OSBGuide. TECOTested.com. Retrieved 2 May 2016.